​Barcelona and Inter's Champions League campaigns get back underway when they square off at the Nou Camp on Wednesday evening. 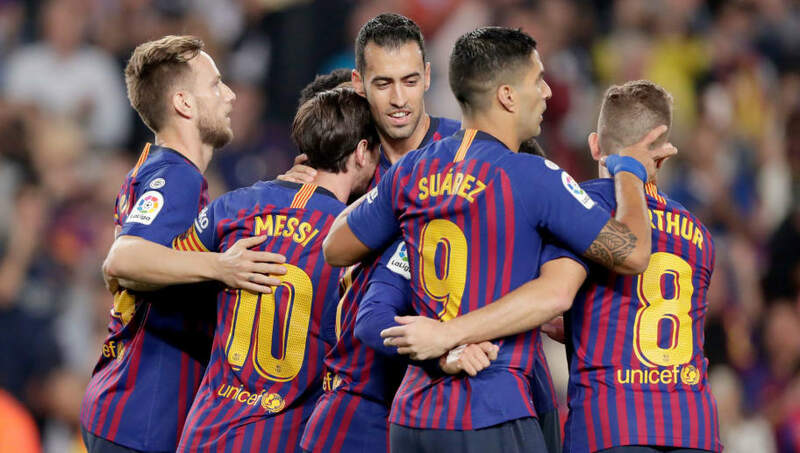 So far, Barcelona's Champions League form has been the most positive aspect of their season, having comfortably dispatched both PSV and Tottenham in their first two matches. However, their league form has been a tad inconsistent, and the Catalan giants are set to be without their talisman Lionel Messi, who is out of action with a fractured arm. As for Inter, they have been able to match Barcelona with regards to their results in Europe. They too defeated PSV and Spurs, but they went about it in a much less convincing manner. Both games finished 2-1 and, in many respects, I Nerazzurri were very fortunate to come away with all three points in both matches. Here's everything you need to know ahead of this potentially titanic clash. It is very rare that you could describe a 1-0 as a 'classic encounter' but ​Barca and ​Inter's Champions League semi-final second leg in 2010 was packed full of drama. The game was finely poised after Jose Mourinho's Inter romped to a surprise 3-1 victory at the San Siro in the first leg, but Barca remained the favourites to pick up a result in front of their own fans. The first half was an incredibly tense affair, with Inter putting on a defensive masterclass to keep out the usually rampant Barca front line. Whereas the first half was relatively quiet, the second was practically explosive. Thiago Motta received a red card midway through the second half for man handling Sergio Busquets, leaving his side at a huge disadvantage, However, it took until six minutes from time for the Inter back line to be breached, courtesy of a classy finish from Gerard Pique. In the second minute of added time, Barca looked to have snatched victory from the jaws of defeat when Bojan Krkic lashed home from close range, but his celebrations were cut short when the referee ruled out the goal for a handball in the buildup. For the most part, Philippe Coutinho has been a hit at Barcelona since making his big money move from Liverpool in January, but there is still a lingering sense that he still has more to give. It is hard to shine when you are in a side littered with talent, but ​Lionel Messi's recent injury means that the Brazilian is set to play in a more advanced role on the left side of a front three - a position he has looked more comfortable in recently. The attacking impetus for Barca is likely to come from Coutinho, which means Sime Vrsaljko is going to have his hands full delaying with him. The Croatian has slotted back into the Inter starting XI seamlessly after returning from injury, but he is yet to have faced a test quite as stern as this one so far this season. As previously mentioned, Messi will be out action for at least the next few weeks as he looks to recover from a broken arm. Meanwhile, Samuel Umtiti and Thomas Vermaelen remain out injured, meaning ​Gerard Pique and Clement Lenglet will start together at centre-back. As for Inter, things aren't an awful lot better on the injury front. Radja Nainggolan is certain to miss out after picking up a knock against AC Milan, whilst Croatian duo Marcelo Brozovic and ​Ivan Perisic are both unlikely to be available for selection. Predicted Barcelona Lineup: Ter-Stegen; Semedo, Pique, Lenglet, Alba; Busquets, Rakitic, Arthur; Dembele, Suarez, Coutinho. Predicted Inter Lineup: Handanovic; Miranda, de Vrij, Skriniar; Vrsaljko, Vecino, Valero, Asamoah; Martinez, Politano; Icardi. No matter how good a side is, when you take Lionel Messi out of the equation, things immediately get a whole lot more difficult. The diminutive Argentinian has carried under performing Barcelona teams all by himself in the past and he won't be there to bail out Ernesto Valverde's side if things start going pear shaped. Inter's form has been rather impressive of late and they seem to have put their inconsistent start to the season well behind them, but their injury concerns leave them in an even more difficult position than Barca. It is set to be a closely fought affair, but the home side should just about have the edge.